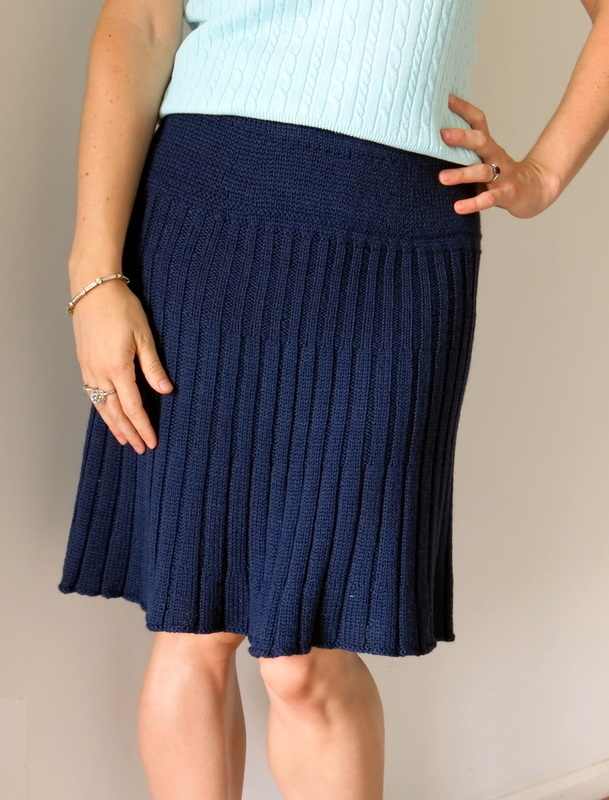 Get ready to twirl in Lucine, a sophisticated and fitted ribbed skirt. Worked in the round from the top down, Lucine features a plain yoke for a smooth fit at the waist, and a fluted rib body that creates a flattering A-line shape. Elastic is added to the waistline to ensure a good fit that will last through repeated wear. Lucine is worn at the low waist, so choose a size that best matches your waist circumference about 1” below the belly button. Length is easily customized. Low waist circumference: 28.25 (29.75, 32, 34.25, 36.25, 37.75)[40, 42.25, 44.25, 45.75, 48]"
MATERIALS Knit Picks Galileo (50% merino wool, 50% viscose from bamboo; 131 yds/ 120 m per 50g ball) color Lunar; 6 (7, 7, 7, 8, 8)[8, 9, 9, 10, 10] balls.